The Sierra Madre Tattler! 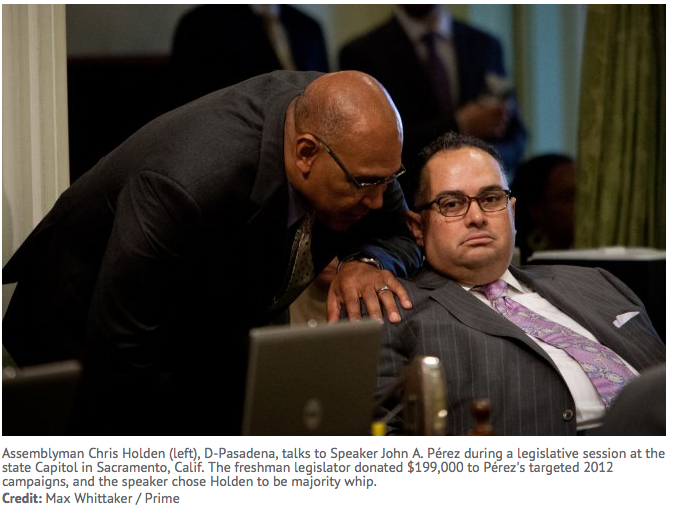 : Ever Wonder How Chris Holden Became State Assembly Whip After Serving Less Than One Year In Office? Ever Wonder How Chris Holden Became State Assembly Whip After Serving Less Than One Year In Office? The Center For Investigative Reporting: California speaker gives Assembly's juiciest jobs to biggest fundraisers (link) - In May 2012 and again in June, Speaker John A. Pérez wrote memos to Democrats in the California Assembly. He wanted millions in campaign cash to win a handful of key races. At stake, Pérez wrote, was their party’s control of the Assembly – and, as it turned out, the perks and power enjoyed by the lawmakers themselves. “It is critical that we band together to maximize our financial resources,” the burly Los Angeles legislative leader wrote in the memos, copies of which were obtained by the Center for Investigative Reporting. The lawmakers gave Pérez what he wanted, state campaign finance records show. Exploiting loopholes in a law enacted to stanch the flow of big money in state politics, the Assembly Democrats pumped $5.8 million into the campaigns Pérez designated, a CIR data analysis shows. The infusion of cash helped the Democrats win a supermajority in the Capitol: two-thirds control of the Legislature for the first time since 1883. The system also paid off for the speaker’s biggest fundraisers in the Assembly. These are seven of the Assembly’s 30 standing policy committees. They control bills affecting the financial bottom line for the Capitol’s wealthiest interest groups: from banks, insurance companies and public utilities to casinos, racetracks and liquor distributors. For lawmakers who serve on them, the committees are a source of political campaign “juice”: abundant donations. Pérez’s spokesman John Vigna said the speaker makes legislative assignments based on merits, not money. “There is absolutely no connection, zero connection, between Speaker Pérez’s leadership selections and any political considerations, including fundraising,” he said. “Speaker Pérez chooses his leadership team based on their ability to serve the people of California” and nothing else, Vigna added. 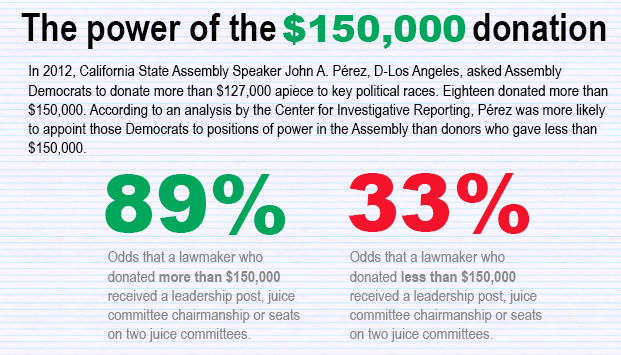 CIR’s analysis of more than 38,000 contributions to Assembly Democrats in the 2011-12 campaign shows a link between donations to the speaker’s targeted races and a lawmaker’s prospects for important legislative assignments. - The mega-donors to Pérez’s targets, three lawmakers who gave more than $250,000, obtained positions of power. Each was named to either a leadership post or chairmanship of a juice committee, along with a seat on at least one juice committee. The top donor, Toni Atkins of San Diego, was named Assembly majority floor leader, next to the speaker, the top leadership post. - Lawmakers who gave more than $150,000 were likely to get multiple important posts. All 18 got one juice committee seat, and 16 got a leadership post, chairmanship of a juice committee or a seat on a second juice committee. - Lawmakers who gave less got less. Donors who contributed less than $150,000 stood a 13 percent chance of heading a juice committee or joining the leadership. No lawmaker who gave less than $40,000 was named chairman of a juice committee. California’s Assembly speakers, Democrat and Republican alike, long have courted the state’s monied interests, seeking campaign funds to win or maintain power in the Legislature. Despite efforts to break this cycle, most speakers also have given political allies leadership posts, committee assignments and other perks. The Pérez memos and the pattern of donations that followed them provide new insights into how those dynamics played out in the 2012 campaign. Phillip Ung, policy advocate for the political reform group California Common Cause, said CIR’s findings are reason for concern. “This system of campaign finance buying leadership on committees” has nothing to do with good government, he said. “When voters see someone is chair of a committee, their expectation is that person is there because that person is a policy expert, not because they bought that chair,” Ung said. Trent Lange, president of the California Clean Money Campaign, described lawmakers as “prisoners” of a process that requires endless political fundraising. Pérez, 43, is a former labor union official and cousin of then Los Angeles Mayor Antonio Villaraigosa, himself a former Assembly speaker. In 2008, with the mayor’s backing, Pérez won his first elected office, an Assembly seat in a heavily Democratic downtown district. The following year, he was elected speaker. Even in an era of term limits, Pérez must leave the Assembly next year, he has emerged as one of California’s most powerful officials. As the memos make clear, Pérez as speaker has sought to raise money to maintain control of the Assembly, which Democrats have dominated for more than 16 years. But raising money is complicated by a campaign finance law aimed at limiting the influence of big money on state elections. For decades, California had no limits on political donations in state campaigns. In those years, the task of raising money for Assembly races often fell to the speaker, experts say. Willie Brown, speaker from 1981 to 1995, told his biographer that he raised up to $8 million per year, much of it from interest groups with business before the Legislature, and spent the money on Democratic campaigns and causes. Republican leaders did the same thing, he contended. After recurrent scandals and calls for reform, state voters in 1996 had had enough. They enacted an extraordinarily tough law to blunt the power of special interests in the Capitol: Proposition 208. The measure said a donor could give no more than $250 to a candidate for the Legislature. But the courts called the measure too restrictive, and it never went into effect. In 2000, then-Gov. Gray Davis and state lawmakers sponsored Proposition 34, a substitute measure that they said also would tamp down the influence of big money in state politics while passing constitutional muster. It had a less-restrictive donation cap, $3,900 in 2012 legislative races, and allowed unlimited donations to state political parties. Voters passed it, too. For a time, Prop. 34 checked the growth of spending in legislative races, experts say. But as Pérez’s memos show, in 2012, the speaker devised a strategy to sidestep the $3,900 donation cap and direct millions in contributions to key campaigns. One memo was written before the June primary and the other in anticipation of the general election in November. In the memos, Pérez ticked off exactly what he wanted from the Assembly’s Democrats, who then numbered 52. For five Assembly candidates facing tough primary campaigns, the speaker wanted each Democrat to give a total of $19,500 – the legal limit of $3,900 per candidate. In the general election, Perez sought $23,400 more from each Democrat. That represented maximum $3,900 donations to candidates in six races Perez targeted. Pérez said it was critically important to elect the lawmakers to maintain Democratic power in the Assembly. For the state Democratic Party’s “candidates support fund,” which by law can funnel contributions to targeted campaigns, Pérez asked for $65,000, also split between the primary and general elections. Finally, the speaker asked for $20,000 to support Proposition 30, Gov. Jerry Brown’s successful tax hike measure, payable to a separate fund set up by the speaker. Pérez told the lawmakers not to send the money directly to the campaigns. Instead, “for proper tracking,” they were told to deliver the money to an office the speaker maintains near the Capitol. To comply, each lawmaker faced the challenge of raising more than $127,000 for Pérez – on top of the $630,000 that, on average, he or she would need for his or her own re-election campaign. In the end, the Democrats gave more money than the speaker had requested. Republicans lost in all the races Pérez targeted, and Democrats wound up with 55 seats in the 80-seat Assembly – one seat more than needed for a two-thirds majority. Meanwhile, as Pérez doled out legislative assignments between August and January, those who gave the most money reaped larger benefits, CIR’s analysis indicates. “Giving contributions to earn yourself a chair or a seat on a powerful committee is not how voters would like to see governing taking place,” said Ung, the Common Cause advocate. Assemblywoman Toni Atkins, the Assembly’s top donor, gave $282,000 to the targeted races, records show. In addition to naming her majority leader, Pérez kept Atkins on a juice committee on which she had served in the previous term: the Health Committee, which has jurisdiction over the heavily regulated health care industry. Before going into politics, Atkins worked as clinical director at a women’s health clinic, according to her Assembly website. With health care finance a dominating issue, records show that health care interests donated $4.8 million to Assembly Democrats in 2012, with more than half going to members of the Health Committee or Pérez’s leadership team. Henry Perea of Fresno, a Pérez loyalist who gave a total of $277,000, was named chairman of the committee that oversees the insurance industry. He retained seats on two other juice committees: the Governmental Organization Committee, with jurisdiction over casino gaming, horse racing and the alcoholic beverage industry; and the Banking and Finance Committee, which oversees financial institutions. Perea is a former Fresno City Council member who previously worked as a congressman’s aide. Pérez’s No. 3 donor, Mike Gatto of Los Angeles, gave $258,000 to the targeted races. The speaker promoted him to be chairman of the most powerful juice committee, the Appropriations Committee, which has jurisdiction over fiscal bills. Gatto also kept his seat on the Banking and Finance Committee. He is a former congressional aide who later practiced civil law. Gatto declined to comment, referring a query to the speaker. Atkins and Perea didn’t respond to requests for comment. CIR’s analysis shows that $150,000 was a cutoff of sorts. Most lawmakers who donated more than $150,000 to the speaker’s targeted races obtained important committee assignments or leadership posts. Including the three mega-donors, 18 lawmakers broke the $150,000 threshold. Pérez named six of them to head juice committees. Five more got leadership posts, and another five got two or more juice committee assignments. Roger Hernández of West Covina, who donated $185,000, wound up with seats on three juice committees: Governmental Organization, Utilities and Commerce, and Health. He was Pérez’s majority whip, but the speaker replaced him in December, after a former girlfriend accused Hernández in court of abusing her and using illegal drugs. Hernández didn’t respond to interview requests. Pérez named two major donors to leadership posts even though they were incoming freshman assemblymen and thus had no Capitol experience. Former Pasadena City Council member Chris Holden managed to steer $199,000 to Pérez’s targets, even as he was raising money to win what at one point was a five-way contest for an open Assembly seat. Pérez made him Majority Whip, replacing Hernández. Holden also was named to two juice committees: Appropriations and Business, Professions and Consumer Protection. In a statement, Holden said he believed he was named whip because of his long service in local government. Anthony Rendon of South Gate, near Los Angeles, an educator and environmental activist, gave $191,000 to Pérez’s targets while raising money for his first run for legislative office. After Rendon was elected, Pérez named the newcomer assistant majority floor leader and appointed him to the Utilities and Commerce Committee. In March, Pérez removed Rendon from the leadership team and named him chairman of the Committee on Water, Parks and Wildlife. It’s not considered a juice committee, but it will play an important role in shaping a proposed $11 billion state water bond measure. Rendon spokesman Bill Wong said his boss requested the new assignment because of serious water issues in his district. For lawmakers who steered less than $150,000, prospects were leaner, the analysis shows. Eighteen lawmakers gave between $40,000 and $150,000. Of those, two were named to leadership positions, and one became chairman of a juice committee. Donations at this lower level didn’t appear to give lawmakers traction with Pérez, according to the analysis. Prospects were poorest for lawmakers who gave less than $40,000. None of this group of 18 lawmakers was named to head a juice committee, and two were named to leadership posts. Perhaps because of personal or political considerations, some lawmakers fared better than others – even when they donated roughly the same amount of money to Pérez’s targets. For example, Bonnie Lowenthal of Long Beach and Das Williams of Santa Barbara were among 18 Democrats who gave more than $150,000 to Perez’s targets. All the others in that group got a leadership post, a juice committee chairmanship or seats on two juice committees. Lowenthal and Williams got one juice committee. Lowenthal also was reappointed as chairwoman of the Committee on Transportation – not a juice committee. She didn’t respond to interview requests. In a phone interview, Williams said hard work – not fundraising – is the key to determining who gets good legislative posts. Williams said he is satisfied with his own assignments. “I wanted to be on Utilities and Commerce because I have a passion for alternative energy, not necessarily because it’s a juice committee, but it happens to be one,” he said. Similarly, Assemblyman Luis A. Alejo of Salinas donated $128,000 to Perez’s targets, while freshman lawmaker Kevin Mullin of San Mateo donated slightly more, $137,000. Alejo was shut out of leadership slots and juice committees. But Mullin, son of former Assemblyman Gene Mullin, was given both a leadership post – assistant speaker pro tem – and a seat on the Business, Professions and Consumer Protection Committee. Another exception was newly elected Assemblyman Phil Ting, the former city assessor-recorder of San Francisco. He gave no money to targeted races, but Pérez named him to the leadership post of caucus chairman. Like many freshmen, Ting couldn’t be blamed for failing to donate in the other races: He spent $1 million to win a tough fight against a well-financed opponent and had $17,000 left when the race was over. Perhaps more to the point, Ting and Pérez have been friends since they were classmates at UC Berkeley. The experience of Assemblywoman Mariko Yamada of Davis was more typical. Yamada raised $249,000 to win re-election, with significant contributions from unions for state employees and teachers. She donated $9,600 to the targeted races, the least of any incumbent Assembly Democrat. When Pérez parceled out leadership posts and slots on the juice committees, Yamada was passed over. Instead, the former social worker was reappointed as chairwoman of the Assembly’s low-profile Committee on Aging and Long-Term Care. She didn’t respond to requests for comment. Pérez’s own donations to the campaigns he targeted were modest. Records show he gave $164,000, less than 17 other Assembly Democrats. 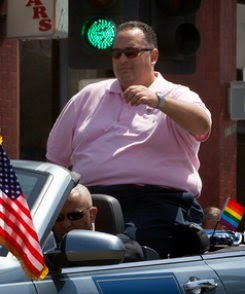 But Pérez was a formidable fundraiser for his own re-election, obtaining $2.6 million. Pérez cruised to re-election in his Los Angeles district, winning more than 82 percent of the vote. He had $1.2 million left over, which by law he can use for a future campaign after he leaves the Assembly. This year, he has raised $103,100 for a campaign for lieutenant governor, records show. This is so corrupt its unbelievable. These are the people who are calling the shots in our state. No wonder Califonrnia is such a mess. Maybe Ken bought Chris the Assembly Whip job as a birthday present. So what's in it for him? There is a write-in candidate from Claremont who will be running in the 41st Assembly District. Do you have this person's name? Nathaniel Tsai will be submitting his nomination papers next week. He is a Republican. I already mailed in my ballot. A little late for a write-in! I wonder if the people who donated money to Chris's campaign knew they'd be helping fund banana republic style corruption? Half the Republicans in Sacramento are Democrats. Half the Democrats are Communists. One, of course they did. that's why they supported him. Second, it's a shame that there is no opposition to Holden's office. A second candidate would at least mean that Holden would have to spend some money on a campaign. As it is, Holden can give away money from his "war chest" to various other candidates he supports, thus strengthening their campaigns while he waltzes to victory. Maybe Chris can buy him some pants. State development mandates for towns like Sierra Madre come from these kinds of crooks. They lie about it being green somehow, but it really is all just a payoff to the developer and real estate lobbies. That is how you sell things like this in California. You tell the suckers it will save the world. Works every time. And it's green, and sustainable. They had a nice party for Chris at Enid Joffe's house. I am sure they all felt quite wonderful about themselves. That Perez is a fat little crook. I used to be a Democrat. Not any more. Now do a story on all the Koch brothers money being tossed around. Money, money, money money ! Being an independent, and therefore owing no allegiance to any of these people, means I get to do stories about whatever I want. In California it is people like the ones discussed today that present the biggest threat. Their pay to play central planning apparatus is pretty much ripping the towns around here apart. Including Sierra Madre. But if I lived in Texas? Sure, I'd write about the Koch brothers. But I only do local politics. I understand, John. This is your blog. Not sure what the term "independent" means anymore. My point is that money is the root of all political evil. I'm with you when you stay within the Michellinda Curtain. The citizens united Supreme Court decision was the ultimate game changer. Corporations are people too, my friend...total BS! As far as the Koch brothers in California politics, just google " Koch brothers dark money in California"... They are everywhere, not just Texas. While we all argue, we have been taken over by the corporate monster. General Eisenhower was right. I enjoy your blog, although I don't agree with everything that I read here (beyond the curtain). Keep up the good work for Sierra Madre. hey Rock Lady, if you're gonna play the "evil" Koch Bros. game, don't forget George Soros and his $1BILLION plus dump into Obama and other Dems' campaigns. Or the gazillions from Hollywood types. But I know, they don't count because they're on your side. If you think this is a "game", you are sadly mistaken. You are right, they all count, all sides! You keep your mindset, and see what happens to all of us in this wonderful country. Money is power. Money is green. Money needs to be removed from our electoral process. Left, right, middle...doesn't matter. Don't assume. It's all about money and the power it can buy. These people don't give a damn about anything else. Money will always be in politics. Politics is all about power. Money follows power and vice verse. When you get to design your own planet, you can skip money if you want. We're dealing with Realville, here. In Realville people also call the crooks out. I hope that doesn't bother you too much. Oh, good. Your next post will be on George Soros, then. Since we're in Realville and not MSNBC. Cable news is for idiots. Until the citizens of each district say to themselves; what have you done for me lately? and stop playing into the political game of . . . Ohhhh; you mailed out expensive looking mailers, you must know what you are doing politically because you used such pretty paper. I don't see California doing well. The old saying of words are just that, it's your actions that may be pleasing or may concern me. Money can be taken out of politics, or strictly curtailed with laws. You seem to reside in Angryville. Or perhaps realestateville...but that's a different topic. Holden is a machine pol. Right out of the Hahn camp. A cancer on us all. Remember Chris Holden's papa was Nate Holden, BIG LA County political machine. Chris has learned well. Hogs at the taxpayer trough, and we laugh at the corruption in 3rd world countries. 1:54, could I get some of what you are smoking? those laws were written by politicians, they know very well how to get around them. 4:38 What laws are you referring to? What solution do you offer? Oh, and could I get some of what you're drinking? Eeesh. Don't have much to add, eh?